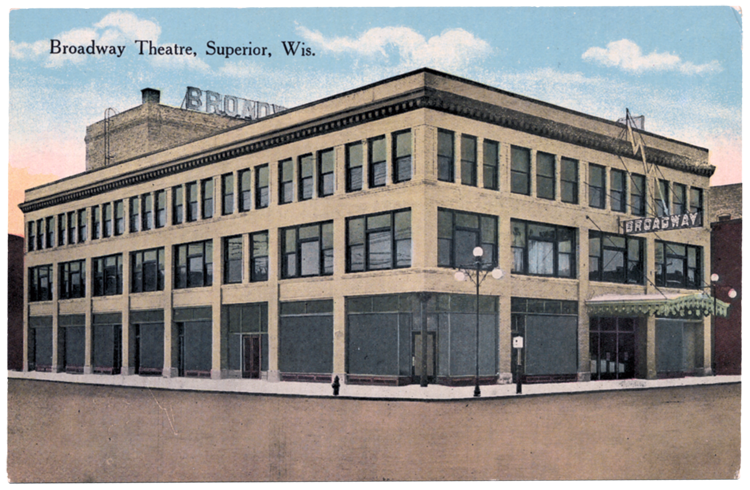 Built in 1906 as a vaudeville house, by 1916 Superior’s Broadway Theatre was also showing movies. A year later it added some rooms and opened a hotel. It closed as a theatre in 1922 and in 1926 the local Eagles Club moved in; in 1940 the hotel changed its name to the Mayeton Hotel. It closed in the 1970s and was later demolished. Today the Kari Toyota Car Dealership occupies the lot on which it once stood. During its first year the Broadway hosted the Marx Brothers, the largest vaudeville act at the time. Julius, Leonard, Milton, and Arthur on the harp entertained Superiorites with their music and comedy review under their stage names Groucho, Chico, Gummo, and Harpo. Herbert (Zeppo) was only eleven years old at the time and hadn’t yet joined his brothers onstage (he eventually replaced Gummo in the act).